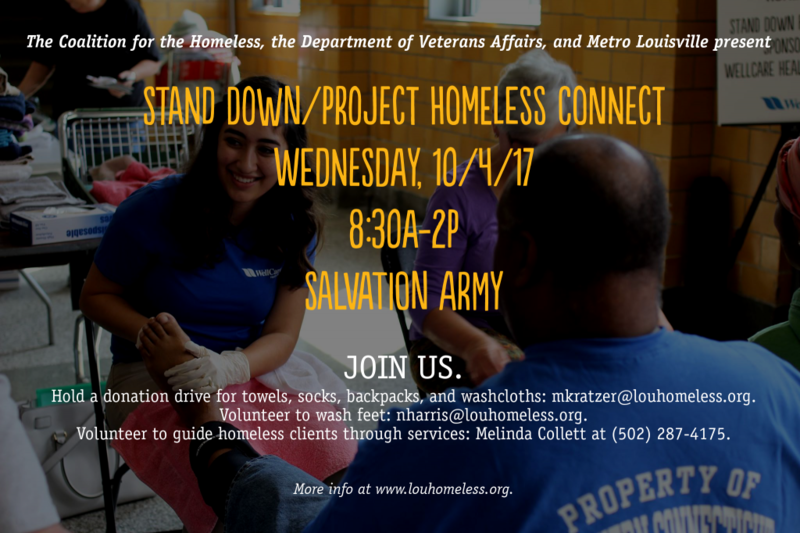 The Coalition for the Homeless, the Department of Veterans Affairs, and Metro Louisville invite you to join us at Stand Down/Project Homeless Connect on Wednesday, 10/4/17, at Salvation Army (located at the old Male High School, 911 S. Brook Street). Again this year, we are looking for volunteers and donors to help us serve the less fortunate. Hold a donation drive for towels, socks, backpacks, and washcloths: contact Melissa at mkratzer@louhomeless.org. Volunteer to wash feet: contact Natalie at nharris@louhomeless.org. Volunteer to guide homeless clients to available services: contact Melinda Collett at (502) 287-4175. Thanks so much for your compassion.